Brakes are the one area of performance modifications that are often misunderstood. Some think the OEM stock is fine, some think that BBKs are a must, and there are probably a dozen or so opinions about x-drilled and/or slotted rotors. Letâ€™s set the record straight once and for all. Start with what you have, and if that currently works for you, keep it. When its time for you to upgrade the performance of your car and step up your driving style, then maybe its time to upgrade your brakes as well. This is where we step in. Here at PWJDMâ€¦ all of our products are well thought out, we donâ€™t just go off on a tangent and do things. We actually do sit down and calculate things out before our moves are made. Our latest and greatest for the monthâ€¦ the PasswordJDM Performance Brake Rotors are no differentâ€¦ 100% drilled, slotted, and zinc plated here in the USA with quality control at every level thatâ€™s common with all PWJDM products. PWJDM Performance Brake Rotors are well thought out. Each design is first proven on a 3D CAD system and then modeled to fit the vane pattern unique to each rotor application. Our goal has always been to improve performance without sacrificing quality. PWJDM starts off by sourcing blank rotors from the best foundries. We offer our rotors in 2 distinct designs. The first design is a X-drilled/slotted rotor thatâ€™s perfect for moderate to aggressive street use. The second design is a dimple drilled/slotted designed for track use. What makes our rotors different from the competition is that we perform all the slotting/drilling in house on our 3axis HAAS CNC machines using only American Made Carbide tooling for precision thatâ€™s unmatched by the competition. Each individual hole is also chamfered on the CNC machines as well. This does cost us a bit more, but the cost is also offset by the fact that everything is done in house other than sourcing the blank rotors from the best foundries. Once drilled and slotted, each rotor is then individually zinc plated within a few hours to protect all raw surfaces against corrosion. Finding a rotor of this quality will probably cost you twice to three times as much with the competition. 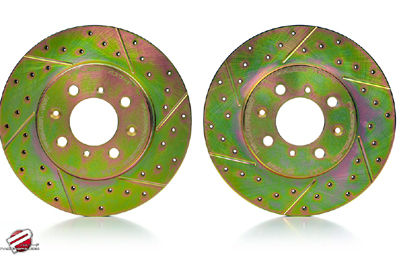 X-drilled/slotted rotors offer the best of both worlds in terms of street performance. X-drilling greatly improves brake response by giving pads the ability to quickly outgas and cool off during pad contact. The slots acts like â€œwipersâ€� clearing the pad face and eliminating the â€œglazeâ€� created by pad friction during contact. We found that this combination although a bit more expensive to produce, actually works best in most application. Use of these rotors has shown to greatly increase brake performance and pad life as a result of the additional cooling from x-drilling. We calculate the number of x-drills and slots based on the size of the rotor, the number of vanes and the application to optimize performance. We think itâ€™s counterproductive to just drill as many holes in a rotor and calling it a performance itemâ€¦ that something the competition would do. As you can see, not all performance 1pc rotors are equal. PWJDM has taken the time to research and design a better rotor option. Our time as been well spent so you can have the best rotors on the market at a price thatâ€™s reasonable. These are definitely the best bang for your buck in these trying times. Buy a set today and startâ€¦ I meant stop as soon as possible. Better brakes should definitely be high on your list of mods to do. When the time comes, remember that PWJDM products are that much better than the competition all because we design and produce each product in house so you can have the best.